Home→Unique Claims to Fame→Salt and Pepper Shaker Museum Gatlinburg, Tenn.
Salt and Pepper Shaker Museum Gatlinburg, Tenn.
Nestled serenely among the picturesque Smoky Mountains lies Gatlinburg, Tenn., its 4,200 residents and the largest collection of salt and pepper shakers in the world. The collection started about three decades ago with a single pepper mill. 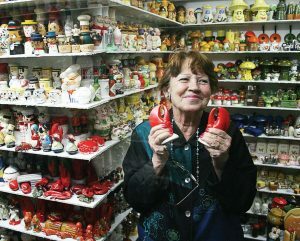 “We did not have a pepper mill at home that worked,” wrote the late Andrea Ludden, who cofounded the Salt and Pepper Shaker Museum with her husband, Rolf, in 2002, on the museum’s website. “So off we went on a quest to find the right one. At first we found one or two, then three or four, until it became an entertainment. Andrea’s background as an archaeologist enticed her to study the history and cultural significance of the shakers. 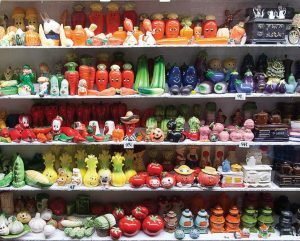 A few years later, when Andrea’s son, Alex, gave her a digital camera for Christmas, she commenced taking photos of her already sizable and steadily growing collection of salt and peppers shakers, which were sprinkled around the family home and stored in boxes beneath the house. She took measurements and compiled meticulous notes about each of the thousands of sets. She undertook the challenge of categorizing each set, a task perhaps rivaling that of lexicographer Peter Mark Roget compiling his first thesaurus. In fact, the museum boasts 20,000 sets of salt and pepper shakers and 1,500 pepper mills, significantly more than the 15,000 words categorized in Roget’s inaugural volume published in 1852. Rolf, a jewelry designer by trade, was attracted by the creative artistry of the various shakers, which the Luddens collected from around the globe. Designs depict the factual and fictional, from U.S. presidents and Amish farmers to Winnie the Pooh and Mickey and Minnie Mouse. Some shakers commemorate natural wonders, such as Niagara Falls and Mount St. Helens. Others depict manmade achievements like Mount Rushmore and the space program. Also represented are thousands of species of flora and fauna from around the world. Categories of shakers are further divided into color schemes. Even after the opening of the first museum in 2002, the Luddens assiduously augmented their collection, necessitating the move to its present larger location in 2004. Arranging the display at the current location took Andrea 45 days. The Luddens opened a sister museum in Spain in 2010 with a similarly sized inventory. The museum has hosted tens of thousands of visitors since it opened near the Gatlinburg entrance to Great Smoky Mountains National Park, the most visited national park in the United States. 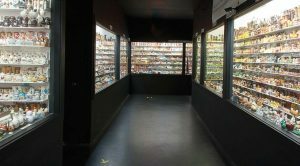 During the summer, upwards of 200 people a day walk the display halls, which are painted black to highlight the collection. 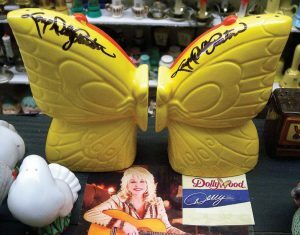 The museum contains a gift shop where the $3 admission — children 12 and under are free — is applied to the purchase of any salt and pepper shaker set. There are 14,000 commercial applications for salt. Canada is the world’s largest consumer of salt. Road salt accounts for much of the total. Pepper is actually a berry and is grown in India, Indonesia, Malaysia and Brazil. Peppercorns can be black, white or green, depending upon their ripeness when harvested. Many factors determine which shaker in a set has more holes. For example, in cultures wary of excessive salt consumption or where salt is rare, the pepper shaker has more holes. The museum is open 10 a.m. to 2 p.m. Monday through Saturday and noon to 4 p.m. Sunday with occasional weather-related closings during the winter. The museum is located at 461 Brookside Village Way, Gatlinburg, Tenn.
For more information, visit www.thesaltandpeppershakermuseum.com or www.facebook.com/spmuseum or call (865) 430-5515.